The U.S. economic growth measured by the Gross Domestic Product (GDP) has significant influence on the U.S. stock market performance and specifically the S&P 500 Index. According to the Efficient Market Hypothesis developed by Professor Eugene Fama, the stock market performance should reflect all known information. If markets are efficient, GDP growth in the current year should be reflected in the stock market performance for that year. This article will try to measure how much GDP growth can influence the performance of S&P 500 Index. If this hypothesis is true, and GDP is a significant explanatory variable, a new linear regression will be used to explain and forecast future S&P 500 Index based on expected GDP growth. Gross Domestic Product is a broad measure of economic growth. GDP consists of Consumption + Investment + Government Spending + (Export – Import) (Landefeld Spring 2008). This article is based on annual GDP numbers, as they tend to include more data and cover greater part of a real economy in comparison to quarterly GDP numbers. Similarly to GDP, S&P 500 Index is also a very broad measure of the US stock market. It is a market cap weighted index, which includes 500 large US companies. Logically, both measures should be highly correlated with each other. In order to test a hypothesis that the stock market performance can be explained by GDP, a linear regression analysis is used. This analysis is based on the dependent variable – S&P 500 Index and one independent variable – GDP. The model is based on 56 annual observations from the year 1957 through 2012. The data is arranged in the following way. 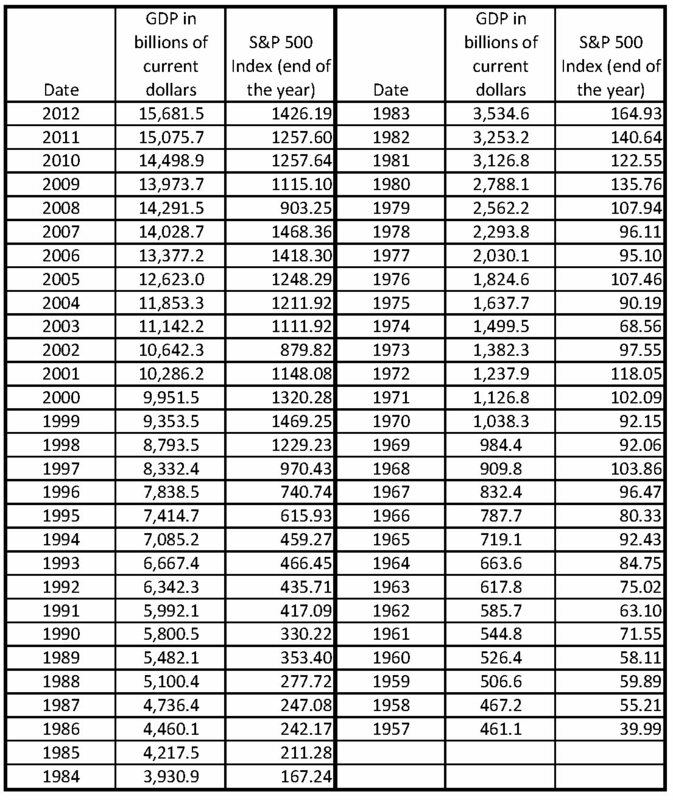 For the year 2012, the closing price for S&P 500 Index is used together with GDP in billion of current dollars for the entire year 2012 (see Table 1). Table 1. Data provided by FRED, Federal Reserve Bank of St. Louis and U.S. Department of Commerce. Results of the linear regression show that GDP can explain 88.76% of performance in S&P 500 Index. The R Square equals to 0.8876 (see Table 2). Another confirmation that GDP can influence S&P 500 Index can be seen in the correlation. Correlation between S&P 500 Index and GDP equals to 0.9421. Both R Square & correlation are high enough to assume a strong connection between S&P 500 Index performance and GDP growth. Next, the model is going to be tested on significance using F-test and T-test. The entire regression model together with its independent variable, GDP, is significant. The F-statistics is equal to 426.43, which is significantly greater than the critical value of 4.0162 for 0.05 significance level. We reject the null hypothesis that the slope coefficient of the GDP equals zero. Since this linear regression model has only one independent variable, the t-statistics confirms the significance of GDP. T-statistics for GDP equals to 20.65026. The t-test has 54 degrees of freedom, using the same 0.05 significance level, the critical value for the t-test statistic is 2.0049. Since the t-statistics for GDP is much greater than the critical value for the t-test, we can reject the null hypothesis that the coefficient of the GDP equals zero. Both F-test and T-test show the significance of GDP in explaining changes in S&P 500 Index. Similar t-test analysis of an intercept shows that we cannot reject the null hypothesis that the intercept equals zero. T-statistics of -1.53961is in between the critical values +/- 2.000. This creates a weakness of the model and possible error in forecasting future S&P 500 Index. Since GDP is a statistically significant independent variable, which may be able to explain most of the performance in S&P 500 Index, the following equation is used trying to predict future S&P 500 Index. S&P 500 Index (at the end of year 1) = -52.7870 + 0.0973 * GDP in Billion of Current Dollars (for the entire year 1). Before we can put this equation in use and forecast S&P 500 Index going forward, we need to estimate GDP growth for the year 2013. According to economic projections of the Federal Reserve Board Members and Federal Reserve Bank Presidents, for the year 2013, percentage change in real GDP is expected to be between 2.3% and 3% and core PCE inflation is expected to be between 1.3% and 2% using the central tendency (December 2012). To calculate the expected nominal change in GDP, core PCE inflation number is added to the percentage change in real GDP. As a result, nominal GDP growth is expected to be between 3.6% and 5.0%. According to the U.S. Department of Commerce, current-dollar GDP increased to 15,681.5 billion USD in 2012 (February 28, 2013). Assuming that GDP will increase between 3.6% ad 5.0% during the year 2013, we calculate GDP in current US Dollar to be between 16,246.03 and 16,465.58 for the year 2013. Please note that these numbers are expectations only and will likely to be different from actual GDP growth in 2013. Using the equation for S&P 500 Index and economic projections by the Fed, we can forecast S&P 500 Index at the end of the year 2013. Based on the linear regression analysis and using economic expectations by the Federal Reserve Board Members and Federal Reserve Bank Presidents, the expected S&P 500 Index at the end of the year 2013 should be between 1,528 and 1,549. The time will show whether this S&P 500 Index forecast and the Fed’s expectations are accurate or not. As can be seen in this article, the stock market performance is dependent on GDP growth. GDP can explain about 89% of the stock market performance measured by S&P 500 Index. The t-test provided additional confirmation that GDP is statistically significant variable in explaining S&P 500 Index performance. At the same time, the model is far from perfect as we failed to prove the significance of an intercept. With this weakness in mind, we went to forecast future S&P 500 Index. The linear regression analysis generated an equation which maybe be used to forecast S&P 500 Index at the end of the year. The Federal Reserve Board Members and Federal Reserve Bank Presidents provided economic projections for the year 2013. These projections were used in the linear regression model to forecast S&P 500 Index to be between 1,528 and 1,549 at the end of the year 2013.